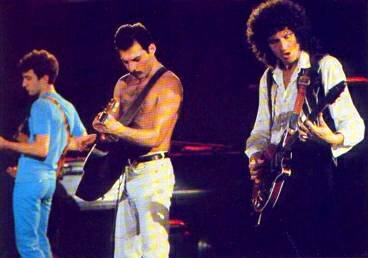 This is Queen's first concert in Mexico. Nine concerts were planned, but only three actually took place. A few days before the show, border officials were bribed in order to let all of Queen's crew into the country which ordinarily limited themselves to granting 6 visas per day - but the crew were 18-strong. Tour manager Gerry Stickells later credited the swift decision to "British ingenuity." The first picture captures the band shortly before they go on. Another top-notch version of Somebody To Love is delivered by Freddie tonight, as his voice is in superb shape. He even hits the high C in the chorus of We Are The Champions, something which he didn't often go for. After he does his vocal exchange with the audience in Now I'm Here, the band jump into their brief improv as usual - but like a couple weeks ago in Caracas, John starts with the (not yet) famous Under Pressure bass line. Freddie then sings the first couple lines of the song, making this a one-time occurrence. Near the end of Fat Bottomed Girls, amongst Freddie's improvising is "ride 'em, amigos!" The Jazz album rocker would be dropped from the set for the remainder of the year. 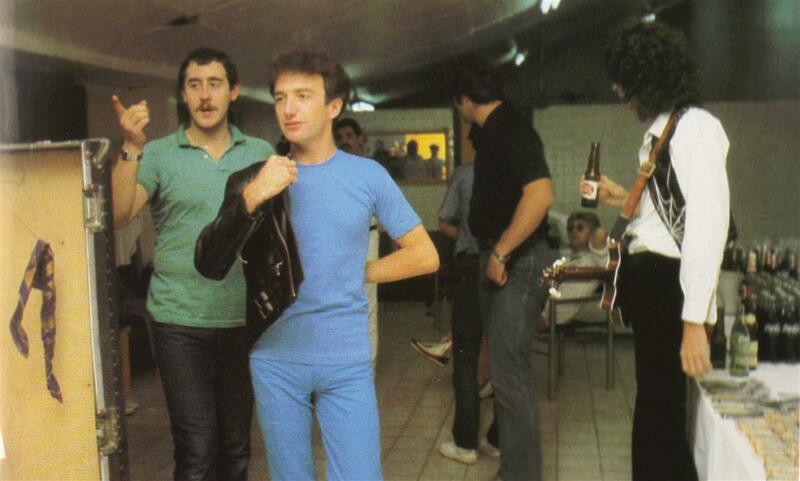 In the middle section of Another One Bites The Dust, John plays the bass line of what would become Back Chat on their next album, Hot Space. Fans who attended the Monterrey show have said it went on without incident. However, things behind the scenes were not going so smoothly. The show was badly organized, and the band were not treated particularly well. The crew's dinner was purportedly from a KFC, but they soon realized it wasn't chicken. Things went badly enough that the band cancelled the next night's show in Monterrey on such little notice. 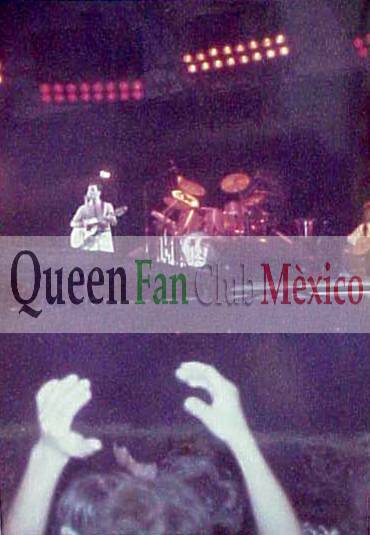 Many of the pictures from the three shows in Mexico are heavily watermarked by the self-imposed coordinator of the Mexican Queen fan club, as he openly refuses to share any memorabilia from these concerts with the public. A 50-minute audience video of the Monterrey show exists, and only a very small number of people outside the fan club have seen it. It was filmed by someone from the local university. Some longer segments from the video have since leaked out, including clips of We Will Rock You (fast), Let Me Entertain You, Play The Game, Somebody To Love, Now I'm Here, Fat Bottomed Girls, Love Of My Life, Crazy Little Thing Called Love, and Bohemian Rhapsody. For an audience-shot film of that age, it's great quality. The beginnings of Now I'm Here and Bohemian Rhapsody are slightly cut on this audience recording. There are additional bits of tape missing after Let Me Entertain You, Save Me, the Now I'm Here reprise, and Love Of My Life. This alternate audience source doesn't sound much better, as it's overloaded in the bottom end. Dragon Attack is missing. This third audience source is incomplete. Keep Yourself Alive and the tympani/guitar solos are missing, as well as the second encore. A cross-fade was done somewhere down the line to disguise the former cut. The quality and the tape speed fluctuate somewhat, but it is the most listenable of the three audience sources (not counting the video, which is leaps and bounds better). This incomplete radio recording is actually the third audience source broadcast on AM radio. It sounds better than the more complete copy, but it has patches of staticky noise all over and some occasional skips. This broadcast is from the 1990s (probably not long after Freddie died), as there is a DJ talking at the beginning over the title track from Innuendo. The versions of We Will Rock You and We Are The Champions heard later during the chatter are from Live Killers. The 49 minute length doesn't include the 2 minutes of chatter. The Monterrey tracks are from the third audience source, and sound a bit better. There is a bit more tape between some songs, and Sheer Heart Attack is complete.